Long story short, I decided it was time to pick up a 3d printer. I’m not normally one to jump on the bandwagon or become an early adopter for the sake of being an early adopter, but I’ve heard enough on the subject to be convinced that 3d printing is not just another fad. It’s legitimately useful, and developed to the point where it’s not unreasonable to start getting involved. Multiple reports from early users showing poor printer accuracy. Smaller build volume compared to the Ultimaker (and most other 3d printers). A time-consuming, messy, and smelly finishing process. Proprietary design with no/few user-serviceable parts inside. Shipping logistics and costs with getting the printer to Australia. A slightly higher base cost. That first point was actually a huge issue for me (what good is a 3d printer if it can’t print, accurately, in 3d?). I even contacted FormLabs Support to see if perhaps the Form 1+ had solved the accuracy issues and what their official calibration tolerances were when shipping a printer. Unfortunately all they could tell me was that the Form 1+ would be “more accurate” than the Form 1, and that they did not yet have any formally established tolerances as far as printer accuracy is concerned. That’s just not good enough. 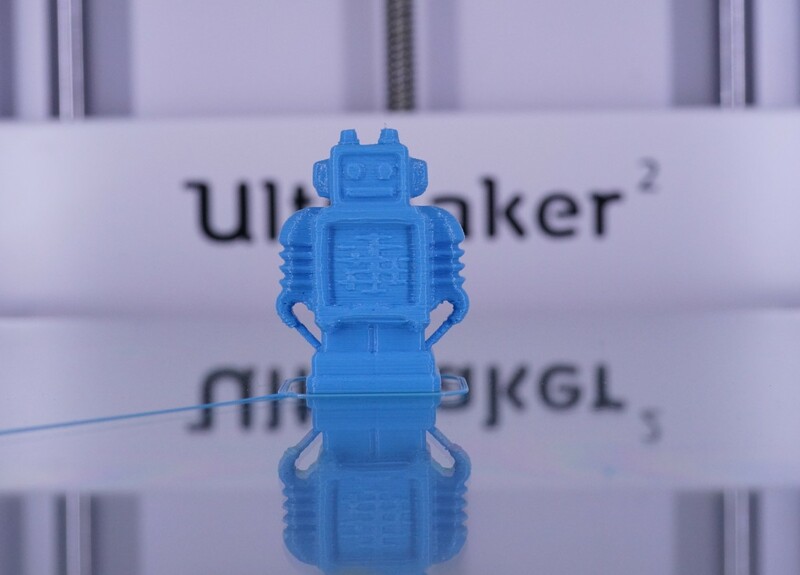 So an Ultimaker 2 is was. The printer arrived last week, and I’m fairly impressed with it so far. It’s very easy to use, and comes with everything you need to get started. As you can see, half of the print looked pretty good, but the other half looked kind of melty. After asking around a bit I determined that this happened due to the geometry of the Ultimaker’s printhead and cooling assembly. The printer comes with a single extruder installed, and with space already allocated for installing a second extruder as a future upgrade. The two extruder nozzles are positioned to be installed side-by-side, in line with the cooling assembly. What this means is that the Ultimaker 2’s cooling setup is actually asymmetrical, with one fan being significantly closer to the extruder nozzle than the other. This causes uneven cooling, and melty-looking results on the side that has the cooling fan further away from the nozzle. In general it’s quite easy to print things. It’s pretty much just load up the part in Cura, transfer to SD card, and go. Cura is fairly easy to use, although some of the more advanced options could use a bit more documentation. My only major complaint about Cura is that in my opinion it’s overly aggressive about automatically retriggering expensive computations (toolpath and model updates) and brings my laptop to its knees as a result. However, Cura is open-source, and with a few hours of tinkering I was able to create a patched version that disables the expensive computations until the user says it’s okay. In the end, the only real issue I see with the printer comes back to the cooling problem that I encountered on the initial print. If the printer is going to ship with a single extruder installed, then the cooling assembly that ships with it should be optimized for use with a single extruder. The dual-extruder shroud could easily be included as part of the upgrade kit for installing the second extruder. Taking it even further, however, what I really think what Ultimaker should do is redesign the printhead assembly by rotating the extruder nozzle locations 90 degrees from their current positions. That would put them in-line with each other but perpendicular to the fans, making them equidistant from the cooling source. It would also allow the same cooling assembly to be used with both single- and dual-extruder setups. Perhaps this is something they’ll consider for the Ultimaker 3. 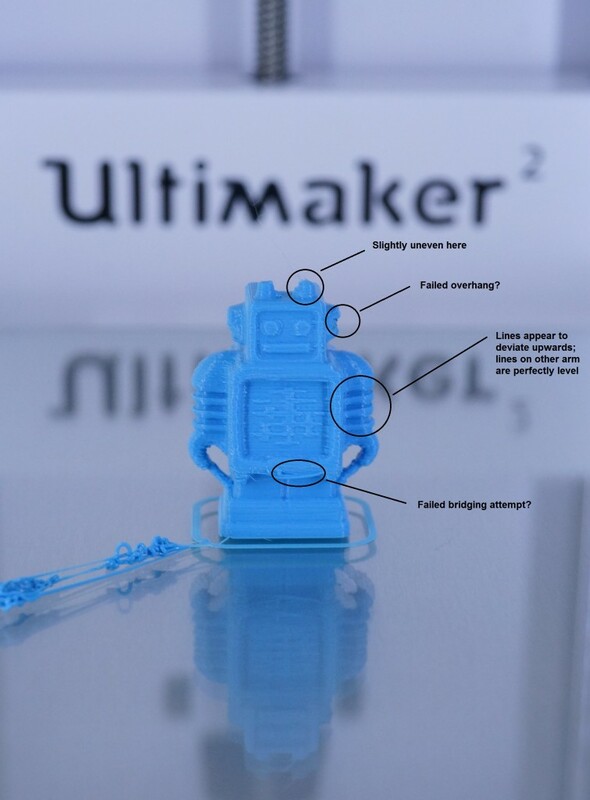 Or the Ultimaker 2+, if they follow the naming conventions that other companies seem to be using. So overall the Ultimaker 2 is shaping up to be a very capable machine that’s simple and straightforward to use. I still think stereolithography is how we’ll end up printing things in the future, but the Ultimaker has shown me that there’s actually quite a bit that can be done with FDM. Oh, and the accuracy? It’s spot on, on all axes. If I tell it to print a 1cmx1cmx1cm cube, that’s exactly what I get. Interlocking parts with relatively small (~1mm) features can be printed with ease. So no issues there. Overall score: 9.0 / 10.0. 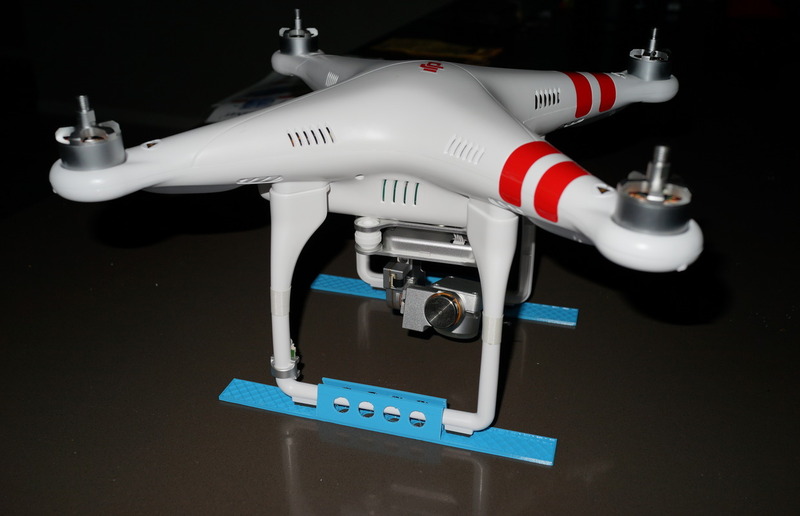 This entry was posted in banter, editorial, hardware and tagged 3d-printing, hardware, review. Bookmark the permalink.